This core curriculum is supplemented by the modules Media Law I & II, as well as courses in Investment and Financing of Media Enterprises and Basic Internal and External Accountancy. These are offered within the context of inter-faculty collaborations and through external teaching contracts. The Master’s Degree Course in Media Management has a standard duration of two years and leads to the acquisition of 120 ECTS credit points. The first semester introduces students to the central aspects of the subject in the form of basic methodology and theory. During the second and third semesters, students are given the opportunity to expand their knowledge by specialising in either Media Management, Media Economics or Marketing and Media. The fourth semester is devoted to completion of the Master’s thesis. Further details of the programme can be found in the curricula. The course contents are divided into modules, which bring together a number of related courses and subjects. - Project Modules A project module generally comprises four courses (e.g. one lecture, two seminars and one colloquium), each of which is worth 3 ECTS credit points. These courses deal in detail with the same subject from a variety of perspectives. Each project module is thus worth 12 ECTS in total. 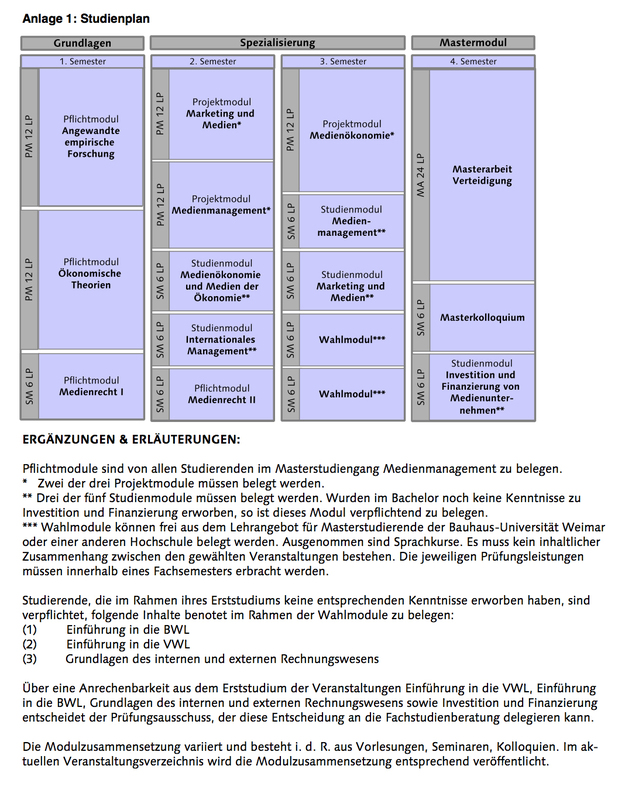 In addition to the compulsory project modules Economic Theories and Applied Empirical Research from the first semester, students must also take two of the three project modules in Media Management, Media Economics and Marketing und Media. - Study modules A study module comprises two courses (e.g. one lecture and one seminar), each of which is worth 3 ECTS credit points. Each study module is thus worth 6 ECTS in total. Media Law I & II and the Master’s Colloquium are compulsory. In addition, three study modules may be selected from the following list: Media Management, Media Economics and Media in the Economy, Marketing and Media, International Management and Media and Investment and Financing of Media Enterprises. - Optional modules Further courses can be selected freely from the Faculty curriculum, as well as from various collaborative inter-faculty programmes Optional modules are worth 6 ECTS credit points each. What role do media play in marketing? What are the particularities of marketing for media markets, consumers, products and enterprises? How are new media influencing companies’ brand management? What is management and what are media? What are contemporary management tools? How were management and organisation perceived in the past and what can we learn from this? How do media markets work? Why are there special rules for media markets? Why are some mergers between media enterprises permitted and others aren’t? What are sharing economy companies and how are they different? Which new forms of work, coordination and employment arise in digital media? How do start-ups transform the media industry? What role does data play in the management of media companies? How do network media change the ways of cooperation in organizations? Please see the course catalogue for an overview of all seminars and lectures currently on offer.